You've heard the old saying 'something borrowed, something blue…', right? These beautiful blue butterfly cake ornaments come in assorted sizes and designs so you can check that item off your list and create a wonderful fluttering wings motif on your wedding cake. 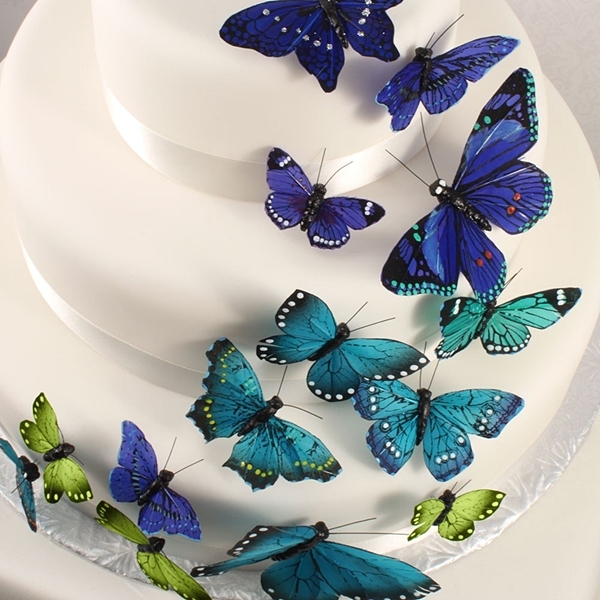 Perfect for a butterfly-themed wedding, these blue beauties will be the icing on the cake! The butterflies are set on delicate wire for easy decorating and feature hand-painted feathers with sparkling crystal accents. PLEASE NOTE: Sold as a set of 24 and prices quoted below are per set.